MIDDLEBURY — Shirley H. Baukat, 92, formerly of Damson Lane in Naugatuck, and the widow of John J. Baukat Sr., died peacefully on April 15, 2019 at Middlebury Convalescent Home with loving family by her side. Shirley was born on Oct. 7, 1926 in Ansonia, the daughter of the late Charles and Rena (Ryan) Higgins, and graduated from Ansonia High School. 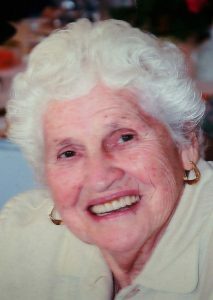 Shirley lived most of her life in Naugatuck, where she was a parishioner of St. Francis of Assisi Church. She retired from SNET, where she worked for 30 years as a telephone operator. Shirley was a member of the Telephone Pioneers, the Ancient Order of Hibernians and the Water Lilies at the Naugatuck YMCA. Shirley is survived by her son, James Baukat; her daughters, Kathleen Donovan (Kevin) and Ann Jones (Mark); her eight grandchildren and seven great-grandchildren; her former daughter-in-law, Raine Levesque, and several nieces and nephews. In addition to her husband and her parents, Shirley was predeceased by her son, John J. Baukat Jr.; her daughter-in-law, Dee Baukat; and her brother, Charles Higgins. A Mass of Christian Burial will be celebrated on Wednesday, April 17 at 11 a.m. at St. Francis of Assisi Church, 318 Church St., Naugatuck. Burial will follow in St. James Cemetery. Calling hour is Wednesday from 9:30 to 10:30 a.m. at the Buckmiller Thurston Mengacci Funeral Home, 82 Fairview Ave., Naugatuck. In lieu of flowers and to honor Shirley’s memory, donations can be made to the Middlebury Convalescent Home, Patient Activity Fund, 778 Middlebury Road, Middlebury, CT 06762.